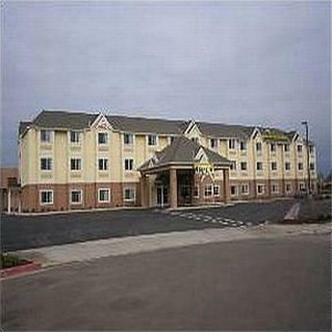 The Tulare Microtel is conveniently located directly off HWY. 99. All rooms and suites are bright and airy with one or two queen-size beds. Oversized built-in desktop workspace, complimentary wireless high speed internet access, complimentary local and long distance* phone calls, iron and ironing board, alarm clock with AM/FM radio, decorative window seat, 27 inch color television with HBO and pay per view movies, individual adjustable thermostat, spacious bathroom with bathroom amenities and hair dryer. Suites also feature a deluxe Hospitality Center with refrigerator, microwave oven, coffee maker, and sink. Sleeper sofa in all suites. All accommodations have coffee makers. Complimentary deluxe continental breakfast. *Complimentary Long Distance is limited to the Continental United States only. Traveling from Fresno, the property is approximately 45 miles South and is conveniently located off HWY. 99. Take the Prosperity Ave. exit,Exit 88. Turn right onto Prosperity Ave. Turn right onto Cherry Street, turn right onto Cherry Court. End at 1500 Cherry Court. Traveling from Bakersfield, the property is approximately 65 miles North and is conveniently located off HWY. 99. Take the Hillman Street exit,Exit 88, toward Prosperity Ave. Stay straight to go onto Hillman Street. Turn left onto Prosperity Ave. Turn right to stay on Prosperity Avenue. Turn right onto Cherry Street, turn right onto Cherry Court. End at 1500 Cherry Court.